← Are you going to be your character? I don’t think he is wrong, but I start to think that what a viewer might want from a picture and what I want from a picture may be different. I think my own idea of ‘what my fantasy art is’ may be changing — I’ll leave it up to the individual viewers to decide for themselves if I am changing it up for the better. In talking about photography, one of my art teachers used to talk about John Szarkowski’s idea of Windows and Mirrors. Szarkowski suggested that some photographs can be compared to windows (we can use the photograph to look at the thing than the photographer pointed his camera towards) and some photographs can be compared to mirrors (the photographer might photograph an object, scene or person but the photograph suggests something to the viewer about the photographer). I’m mangling and oversimplifying, but I hope you get the general idea. When we talk about ‘fantasy art’ that ends up published on the covers of books or in games, most of the time we are talking about pictures that I would call ‘illusions.’ ‘Illusions’ are sort of like Szarkowsi’s ‘windows.’ I would describe illusion pictures as those in which the artist seeks to give the viewer the impression that you are looking at the fantasy scene itself. 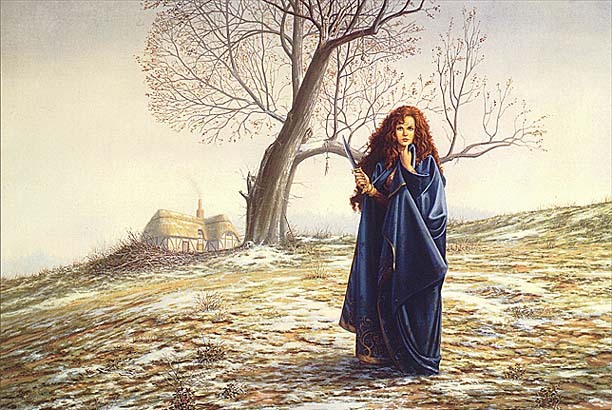 In the painting at right, “Early Snow,” Larry Elmore seeks to give his fantasy scene the illusion of reality. He has rendered the tree branches, the blades of grass, the folds of clothing, etc., all to look almost ‘photographic.’ The people might be idealized (I don’t think Elmore paints many (or any) women who don’t look like models) and the things portrayed might not be ‘real’ (dragons and unicorns), but the painting itself might be described as ‘realistic’ in style. I think the ‘Illusion’ picture is pretty much the standard in what gets published in many parts of the book and game industry (there are probably all sorts of genres and sub genres like Anime that don’t fit into that category, but, not knowing much about Anime I’ll stay away from discussing it). Another type of fantasy picture, and a type that I find myself more and more interested in, is what I might call an ‘interpretation’ picture. This is more like Szarkowski’s “mirror” concept. Although dragons, unicorns, women and snow covered hills might be the literal subject matter of these pictures, the artist is perhaps less worried about giving you the illusion of the reality of the scene and more interested in perhaps telling a story — the style might be said to be more ‘expressionistic’ than ‘realistic.’ One artist whom I have mentioned before on the blog is a guy working in Cali named Skinner. I love his work but I would never term it to have the ‘illusion’ of reality that one might find in an Elmore painting. I have my own preferences, but I’m not trying to demean Elmore’s work or denigrate those who like it. But making art seems more like a journey lately than anything else, so I am thinking about these things to try to plan where I want to try to go next. I think my own picture of the Coverse-All-Star shoe wearing orcs (above) doesn’t really fit neatly into either category, but I think I’m currently closer to an ‘interpretative’ artist than an ‘illusionist.’ I’m no Larry Elmore — I couldn’t paint a convincing illusion if I tried and all of my characters come out looking sort of google-eyed and desperate… but I find myself changing up the details and inserting tidbits to amuse myself — like tennis shoes on the orcs — which sometimes push the picture out of the realm of ‘illusion’ even more than my particular drawing style already might have done (you can call my style of drawing ‘lowbrow’ or ‘cartoonish,’ I don’t consider it an insult). 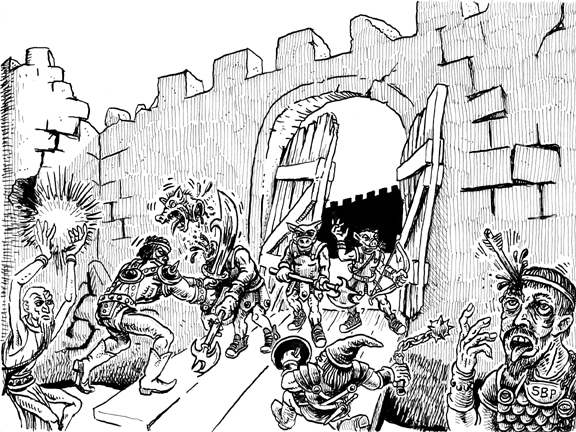 I don’t see anything wrong with orcs ghosting fools while wearing Chuck Taylors. It’s a comfortable shoe for battle. And the rubber soles make it less likely that you will slip in the puddles of your opponent’s blood, which is always a worry. And your fighter /barbarian is clearly wearing cowboy boots. Anybody who thinks “verisimilitude” is one of the things you go for in your pictures is probably just really drunk all the time. The world never looked like that. That’s the point. Zak: The weird thing is that I try to draw stuff ‘right.’ I just don’t think I can.